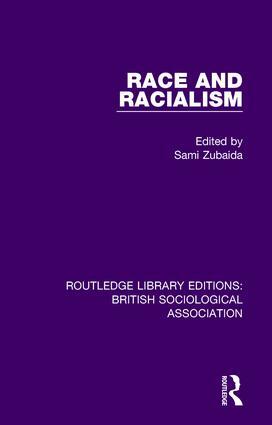 Originally published in 1970, Race and Racialism aims to bring race discussions into the mainstream of sociological discussion through scrutinizing concepts that defines theoretical issues. The book also locates race-relation situations in the context of the wider social structure and historical developments. Contributions raise the question of the abuse of biological and sociological theories in justifying social attitudes and policies and address various principles of social stratification that bear on the study of race relations. The book also looks at the how no special social categories are required to explain the structure and dynamics of race relations, and how the concept of plural society represents a significant theoretical development. The volumes in this set, originally published between 1969 and 2001, is comprised of original books published in conjunction with the British Sociological Association. The set draws together original research by leading academics based on study groups and conference papers, in the areas of youth, race, the sociology of work, gender, social research, urban studies, class, deviance and social control, law, development, and health. Each volume provides a rigorous examination of related key issues. This set will be of particular interest to students and academics in the field of sociology, health and social care, gender studies and criminology respectively.